Tuesday Ryan-Hart, Tim Merry, Caitlin Frost and I are just returning from a gathering of experienced Art of Hosting practitioners from around the world. One of the threads in our gathering was and exploration of how the practice of hosting and harvest conversations in the world can be applied to working with groups in ever increasing scale and influence. This is the core inquiry of our new Beyond the Basics offering.. Being skillful facilitators of dialogue is obviously not enough to make shifts in systems, although dialogue is a powerful place for people in a system to start to understand the complexity, diversity and challenges that we are dealing with. It is also the prime vehicle for locating the innovation at the edge of the collective intelligence in the system that helps design innovations in systems of all kinds. . But alone, dialogue is not enough. Shifting systems requires us to apply dialogic practices and participatory leadership in a series of connected events throughout a system. Dealing with the complexity of shifting systems requires that we build depth in the capacity of core teams that are holding the work. A key part of our work is nto build capacity and depth in core teams to host systems work together. Building the capacities of core teams is a marker of the success and sustainability of the kinds of participatory initiatives that achieve lasting results and outcomes. Where we have worked with systems where the consulting team retains the capacity, the initiative tends to fizzle when the contract ends. 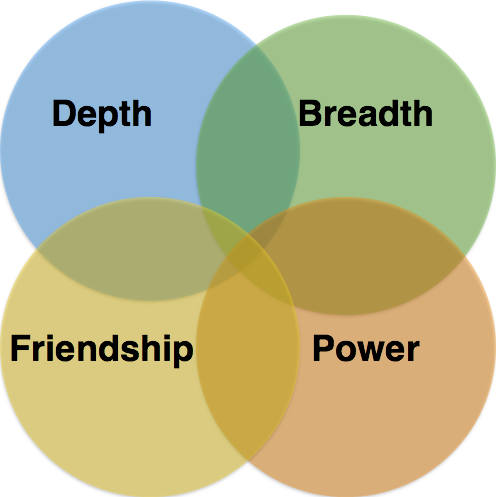 Sustainability and lasting results lie at the intersection of depth, breadth, friendship and power. Core teams need to operate deeply, which means that they need to be engaging beyond the facilitation of hosted events. Good core teams ARE the field they are influencing and therefore they have to be practiced at going deep into their own dynamics to begin to make changes in a system. And they hold a level of depth that allows them to see and sense together strategically as an initiative unfolds. To scale up initiatives, a team needs to then achieve breadth without sacrificing depth. More people need to be involved in core hosting of the work. But this cannot be a classical “train the trainer” model. It takes time for more practitioners to come into the field. The initial core team must not only train others in systems work but also become teachers and mentors of new practitioners and protect the work as it gets off to it’s shaky start. Going nto scale means lots of learning happening in public, so connecting people together in learning becomes crucial. The architecture that keeps breadth connected to depth rests on trust, and so friendship becomes a powerful part of the operating system. In complex systems work there are times when formal accountabilities don’t ensure the levels of trust and commitment that is needed, and only a field of deep trust between people will sustain the practice and sustain the resilience as groups go through the difficult parts of systemic evolution. The challenge here is that we then need a new conception of power, because power in existing systems tends to come from accountabilities for results delivered against known and predictable plans. Participatory work is a huge challenge to power because it requires everyone in the system, to work from a position of trust and uncertainty while still staying accountable for results. When working in any human system, issues of visible and invisible power and privilege are important strategic acupuncture points for change. And if we don’t pay attention to them we can find ourselves mired in simple relationship building projects or in oppositional and combative power struggles. We find trust and commitment eroding and we lose the breadth required for impact. As a team this is our learning edge. We have many stories to share and tools and practices that help us be in this work, but we are also excited for our BtB offering to be a place where we co-discover with others the deepest challenges at these edges and perhaps even co-create new collective knowledge about how the art of hosting and harvesting can work in these domains. Our beyond the basics offerings is informed by and structured around learning, discovering and implementing practices that integrate these approaches to working in complex environments with complex challenges. We have discovered that there are personal practices of coaching, mentoring and support that complement a deep skill set in designing, hosting and harvesting participatory process and a fierce commitment to creating architectures of implementation that respect and work with the existing power structures in a way that protects results while also building the capacity for uncertainty. As we work towards the BtB workshops in 2014- and 2015 we will be continuing to share learnings, resources and case studies here on this blog and we invite your own questions and inquires about this practice as we move towards learning together. What I miss in the description of friendship, is the levels of awareness and consciousness that are needed to make core teams that can do all these things well that you describe. It is not just friendship or trust… we trust that others are able to apply awareness on different levels and areas of life… more to say on this, but I leave it for now. Thanks a lot for this offering, very meaningful, brave and deep message.